An opulent cocktail den located in one of New Delhi’s finest hotels, Blue Bar impresses both indoors and out with its refinement and see-and-be-seen scene. A sleek space both inside and outside of the grand Taj Palace Hotel, Blue Bar is the home-away-from-home for New Delhi’s swanky set and the residence of some of the finest cocktails in all of New Delhi. The interior of Blue Bar is the utmost of opulent, featuring velvety curtains, plush crimson seating, chandeliers, marble touches, and a state-of-the-art bar top backed by glamorous jagged mirrors. And we’re not joking when we say that the bar is state-of-the-art at Blue Bar, as it appears solid during the day, but as night falls, by use of millions of fiberoptic threads, it appears to sparkle, shooting dazzling rays of lights into drinks placed upon it. This sets the tone for the whole venue, which only gets grander as you venture outside, into the embrace of an exotic al fresco exterior experience featuring bonsai trees, oversized purple couches, and imported French flame-holders – all facing a sprawling green garden. The creative signature cocktails on offer at Blue Bar are as stunning and elegant as the venue itself with two of the highlights being the Goan Pirate – curry leaf, cashew, turmeric-infused premium dark rum, coconut water, kokum syrup, and tandoori charcoal bitters – and the refreshing Summer Salad – premium vodka infused with raisin and hazelnut, English mustard, papaya and rocket bitters. 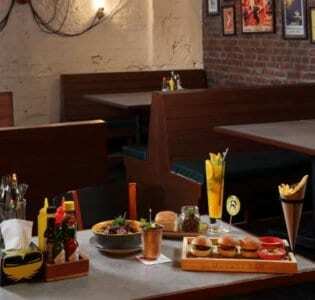 These signature drinks are complemented by a full range of infusions, ‘fluid chef selections’, and classics from all around the globe, and there’s even a range of gourmet Indian-inspired bites if you get hungry.